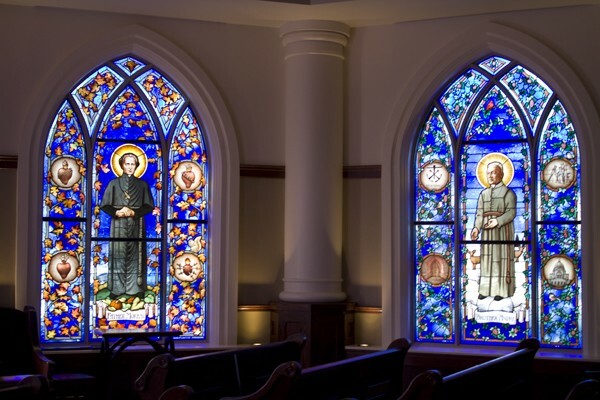 At the Catholic University of Notre Dame in Indiana, four new windows were created and installed in the Stinson-Remick Hall by Conrad Schmitt Studios. The College of Engineering’s new Stinson-Remick Hall is a 142,000 square-foot building on Notre Dame Avenue near the campus entrance. 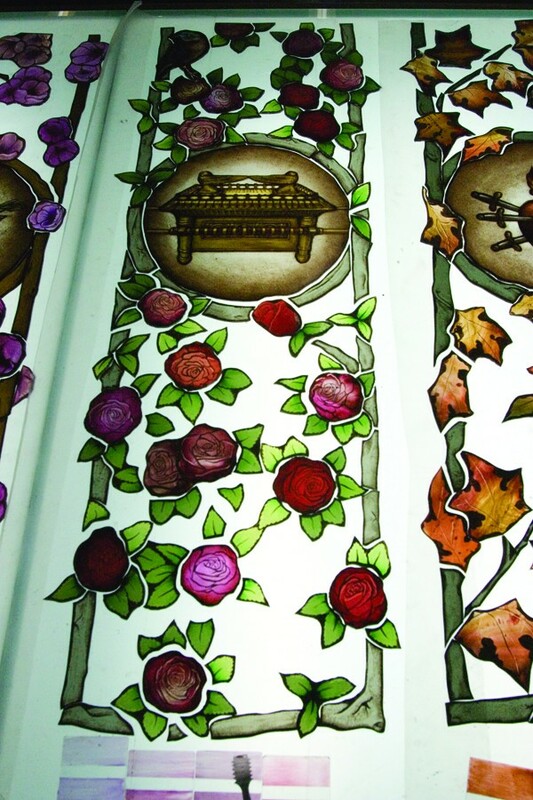 Each of the four windows represent a season of the year, with flora and fauna corresponding with each season. Within the side lancets are medallions symbolizing an aspect of the figure depicted. 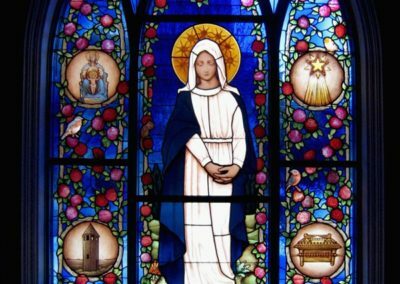 The predominant color in the background and border is blue, the color of Our Lady. 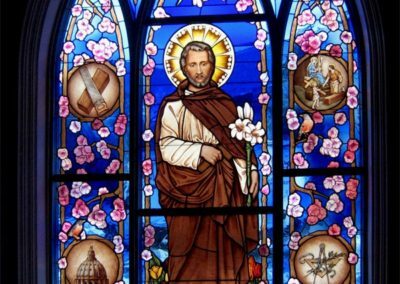 Spring is represented by the blooming cherry blossoms and behind St. Joseph is a bed of tulips. Above his head are two mourning doves, along with two robins in the outside lancets. 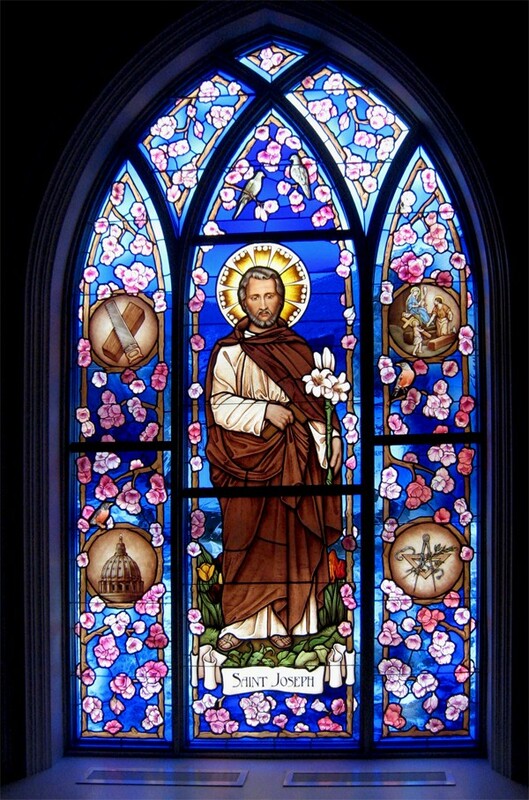 The Easter lily he holds in his hand symbolizes his love for the Virgin Mary. The symbols in the flanking lancets are a crossed saw and block of wood for his carpentry; the dome of Saint Peter’s; a scene with his Holy Family; and a triangle and dividers, further representing his vocation. Autumn is symbolized by maple leaves, a patch of pumpkins, geese, a finch and a squirrel. 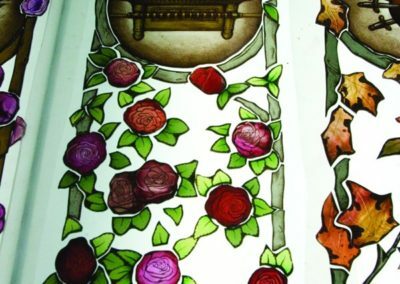 Additional symbols include the Sacred Heart of Jesus, the Sacred Heart of Joseph, the Sacred Heart of Mary and the Seven Sorrows of Mary. 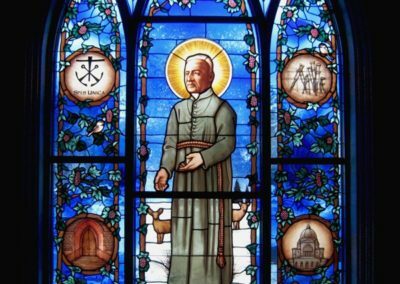 Father Moreau is the French priest who founded the Congregation of Holy Cross, a congregation of priests and brothers founded in 1837. 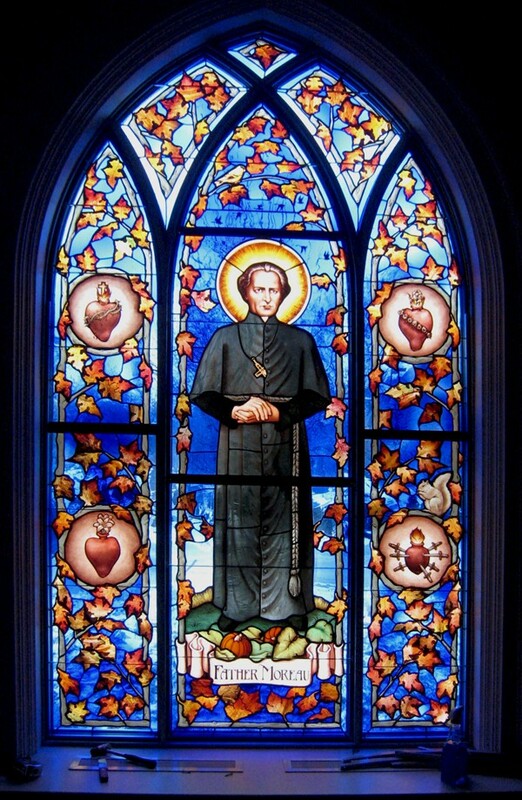 From this, three more congregations were founded including: Marianites of Holy Cross, the Sisters of the Holy Cross in Montreal, Canada and the Sisters of the Holy Cross in Notre Dame, Indiana. Winter symbols include holly leaves, berries and falling snowflakes. 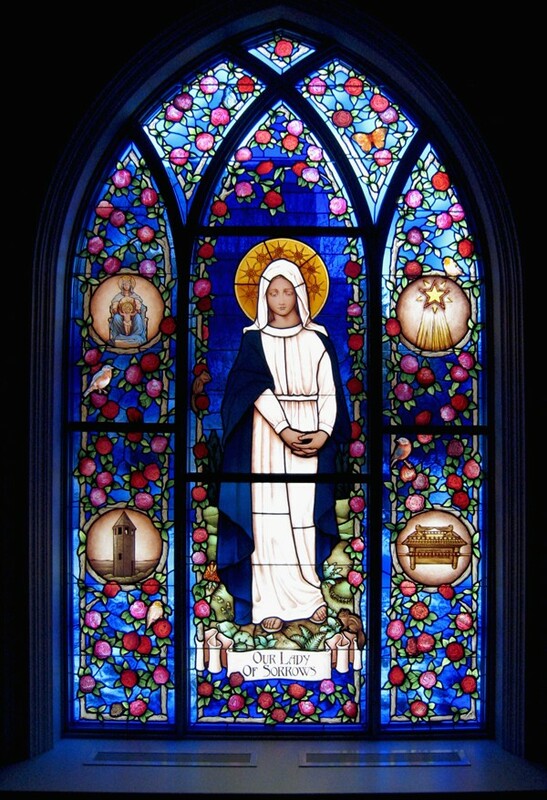 The Congregation of Holy Cross, the door of the Cathedral Basilica of Notre Dame de Quebec and the dome of St. Joseph’s Oratory are also featured. Brother Andre was a Brother of the Congregation of Holy Cross. He is credited with thousands of reported miraculos healings. 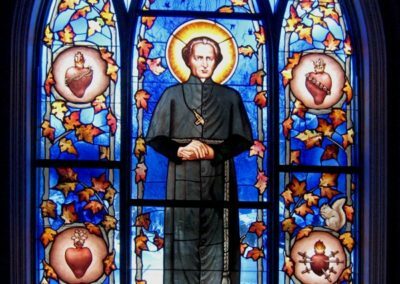 Brother Andre was declared venerable in 1978, was beatified by Pope John Paul II in 1982. 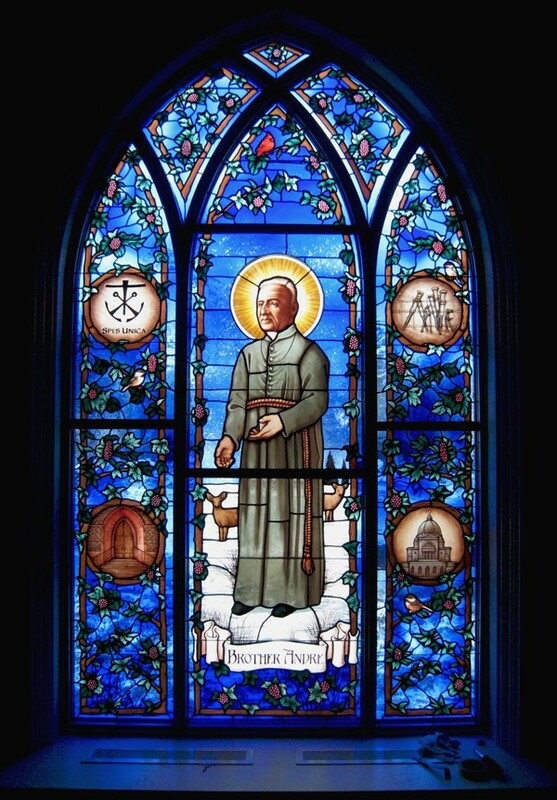 In 2010, Pope Benedict XVI approved the decree of sainthood for Blessed Andre.